What is the Rule for Stopping for a School Bus? Under Washington law, stopping for a school bus is required when the motorist is driving in the same direction as the bus or approaching an oncoming bus. If a driver is heading the opposite direction of the school bus, they don’t need to stop unless it is a two-lane road. Bus drivers will use red stop signs and lights to signal such a stop. Bus drivers may also use yellow lights to indicate they are slowing down and preparing to stop. Bus drivers are trained to be on the lookout for cars and use caution when making pickups and drop-offs, but the duty remains on other drivers to pay attention and obey the law to avoid an accident and keep children safe. The driver of a vehicle upon overtaking or meeting from either direction any school bus which has stopped on the roadway for the purpose of receiving or discharging any school children shall stop the vehicle before reaching such school bus when there is in operation on said school bus a visual signal as specified in RCW 37.190and said driver shall not proceed until such school bus resumes motion or the visual signals are no longer activated. The driver of a vehicle upon a highway divided into separate roadways as provided in RCW 61.150need not stop upon meeting a school bus which is proceeding in the opposite direction and is stopped for the purpose of receiving or discharging school children. The driver of a vehicle upon a highway with three or more marked traffic lanes need not stop upon meeting a school bus which is proceeding in the opposite direction and is stopped for the purpose of receiving or discharging school children. The driver of a school bus shall actuate the visual signals required by RCW 37.190only when such bus is stopped on the roadway for the purpose of receiving or discharging school children. The driver of a school bus may stop completely off the roadway for the purpose of receiving or discharging school children only when the school children do not have to cross the roadway. The school bus driver shall actuate the hazard warning lamps as defined in RCW37.215before loading or unloading school children at such stops. Except as provided in subsection (7) of this section, a person found to have committed an infraction of subsection (1) of this section shall be assessed a monetary penalty equal to twice the total penalty assessed under RCW 63.110. This penalty may not be waived, reduced, or suspended. Fifty percent of the money so collected shall be deposited into the school zone safety account in the custody of the state treasurer and disbursed in accordance with RCW 46.61.440(5). An infraction of subsection (1) of this section detected through the use of an automated school bus safety camera under RCW 63.180is not a part of the registered owner’s driving record under RCW 46.52.101and 46.52.120, and must be processed in the same manner as parking infractions, including for the purposes of RCW 3.50.100, 35.20.220, 46.16A.120, and 46.20.270(3). However, the amount of the fine issued for a violation of this section detected through the use of an automated school bus safety camera shall not exceed twice the monetary penalty for a violation of this section as provided under RCW 46.63.110. If a law enforcement officer investigating a violation of RCW 46.61.370 has reasonable cause to believe that a violation has occurred, the officer may request the owner of the motor vehicle to supply information identifying the driver of the vehicle at the time the violation occurred. When requested, the owner of the motor vehicle shall identify the driver to the best of the owner’s ability. The owner of the vehicle is not required to supply identification information to the law enforcement officer if the owner believes the information is self-incriminating. RCW 46.61.372: School bus stop sign violators—Report by bus driver—Law enforcement investigation. The driver of a school bus who observes a violation of RCW 61.370 may prepare a written report on a form provided by the state patrol or another law enforcement agency indicating that a violation has occurred. The driver of the school bus or a school official may deliver the report to a law enforcement officer of the state, county, or municipality in which the violation occurred but not more than seventy-two hours after the violation occurred. The driver shall include in the report the time and location at which the violation occurred, the vehicle license plate number, and a description of the vehicle involved in the violation. The law enforcement officer shall initiate an investigation of the reported violation within ten working days after receiving the report described in subsection (1) of this section by contacting the owner of the motor vehicle involved in the reported violation and requesting the owner to supply information identifying the driver. Failure to investigate within the ten working day period does not prohibit further investigation or prosecution. If, after an investigation, the law enforcement officer is able to identify the driver and has reasonable cause to believe a violation of RCW 61.370has occurred, the law enforcement officer shall prepare a notice of traffic infraction and have it served upon the driver of the vehicle. Overtaking or meeting private carrier bus—Duties of bus driver. The driver of a vehicle upon overtaking or meeting from either direction any private carrier bus which has stopped on the roadway for the purpose of receiving or discharging any passenger shall stop the vehicle before reaching such private carrier bus when there is in operation on said bus a visual signal as specified in RCW 37.190 and said driver shall not proceed until such bus resumes motion or the visual signals are no longer activated. The driver of a vehicle upon a highway divided into separate roadways as provided in RCW 61.150 need not stop upon meeting a private carrier bus which is proceeding in the opposite direction and is stopped for the purpose of receiving or discharging passengers. The driver of a vehicle upon a highway with three or more lanes need not stop upon meeting a private carrier bus which is proceeding in the opposite direction and is stopped for the purpose of receiving or discharging passengers. The driver of a private carrier bus shall actuate the visual signals required by RCW 37.190 only when such bus is stopped on the roadway for the purpose of receiving or discharging passengers. The driver of a private carrier bus may stop a private carrier bus completely off the roadway for the purpose of receiving or discharging passengers only when the passengers do not have to cross the roadway. The private carrier bus driver shall actuate the hazard warning lamps as defined in RCW 37.215 before loading or unloading passengers at such stops. RCW 46.61.380: Rules for design, marking, and mode of operating school buses. The state superintendent of public instruction shall adopt and enforce rules not inconsistent with the law of this state to govern the design, marking, and mode of operation of all school buses owned and operated by any school district or privately owned and operated under contract or otherwise with any school district in this state for the transportation of school children. School districts shall not be prohibited from placing or displaying a flag of the United States on a school bus when it does not interfere with the vehicle’s safe operation. The state superintendent of public instruction shall adopt and enforce rules not inconsistent with the law of this state to govern the size, placement, and display of the flag of the United States on all school buses referenced in subsection (1) of this section. Rules shall by reference be made a part of any such contract or other agreement with the school district. Every school district, its officers and employees, and every person employed under contract or otherwise by a school district is subject to such rules. It is unlawful for any officer or employee of any school district or for any person operating any school bus under contract with any school district to violate any of the provisions of such rules. 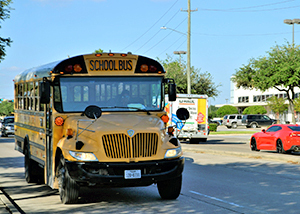 Traffic and confusion surrounding school busses can quickly lead to a car accident. If you are injured in an accident you need an experienced and knowledgeable personal injury lawyer in Spokane on your side. The attorneys at Parke Gordon Law Firm will work hard to get you the compensation you deserve. Contact the law office of personal injury attorney Mat Parke today for a free consultation. This is your opportunity to speak with an experienced personal injury attorney about your case for free. Call (509) 482-7274 to get started on receiving a fair settlement from your personal injury case.